2016 has been another solid year for music and, in my world, getting exposed to more fun tunes from the CTT blog. Since today will be the last post of 2016, I look forward to another year of introduction to new stuff and continued exposure to hits from what seems like a past life. Today is a band from the latter—a group that sort of dominated ‘90s airplay, selling over 20 million albums to date. Adam Duritz and David Bryson connected while they were each living in the Bay Area of California. Adam was in a band called “The Himalayans” and David was a producer/guitarist without any projects. The two met, decided to form a band, and named it after a superstitious nursery rhyme about counting magpies. 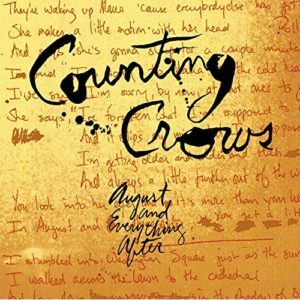 Duritz heard the rhyme in the film “Signs of Life” which starred a friend, and chose the new band name as an ode to her of sorts—and Counting Crows was born. Heading into the studio, the band utilized most of the demos they’d previously created to put together an album. Still, it took a little bit to come together, since they focused so hard on live performances. Finally their debut, August And Everything After, was released in September of 1993. Geffen put them on a two-year tour headlining and backing up big bands throughout the world. While on the road, a song that Duritz wrote about a childhood friend and the dream of making it big in the music business began taking off. MTV would air the video, radio stations caught wind, and the track “Mr. Jones” started a wildfire for the band. The record would become the fastest selling album since Nirvana’s “Nevermind” and publications like Rolling Stone took notice, and gave the record great reviews. 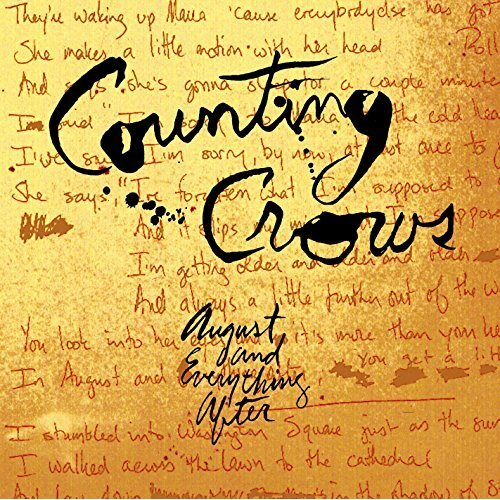 Counting Crows has always been one of those bands I sort of forget about, and then I’ll catch one of their many hits on the radio and think, ‘oh yeah, I remember those guys.’ This album came out at such an odd time for the type of music—it’s got sort of an indie rock/pop feel to it, but the band got lumped into the grunge or alt rock movement, even though they really had no part in it. The handful of negative reviews I’ve read were fixated that the band wasn’t full of angst and attitude, but that was never the goal of the band—and I think that’s part of their popularity. Tracks like “Mr. Jones” or “Rain King” were such a departure from pop radio at the time, I think the U.S. had a fair amount of population ready for a change. While maybe not one of the greatest bands in history, the Crows certainly have their following and continue to make music to this day. For those of us in currently frigid Wisconsin, this album has a great rainy day (or freezing day), stay-inside type of feel to it. A nice mellow record to vibe out to and it’s a steal at $5 bucks. You could buy it for a white elephant gift and then make sure you get it back for yourself. Smart move. Happy Holidays all!